With all the war fever about re-invading Iraq, the press and politicians are ignoring the opinion of the veterans of our last war in the Gulf. But we veterans were there, and we have unique and critical first-hand knowledge of the course and consequences of warfare in Iraq. Our opinions should be solicited and heard before troops deploy for battle, not after they have returned wounded, ill or in body bags. 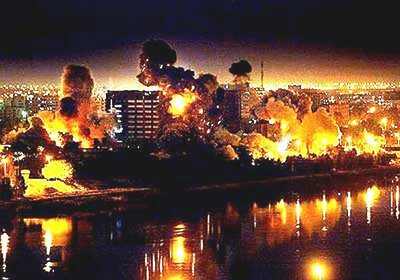 Another invasion of Iraq in 2002 will be very different from the invasion of 1991. The war’s mission has changed in the intervening years, from removing Iraq from Kuwait to removing the entire Iraqi government and military establishment from power. Because the goal of the U.S. military has changed, the Iraqi army may retreat to the cities, where they may face better odds than in the desert. During the open desert tank battles of ’91, U.S. tanks out-classed and out-fought obsolete Iraqi tanks, and U.S. infantry captured tens of thousands of poorly supplied Iraqi soldiers operating without command and control from Baghdad. But in the urban warfare scenario of 2002, pitched infantry skirmishes and ambushes in cities may present a more level battlefield for Iraqi troops fighting in their hometowns. The Iraqi military can be expected to fight for each block within each city with the most ruthless means available. When faced with the impending overrun of their nation, the Iraqi military didn’t hesitate to use chemical weapons against Iran. Because of these significant differences, here are 10 reasons why, as a Gulf War combat veteran, I oppose a second Gulf War as a costly and preventable mistake. 1. U.S. troops are vulnerable to Iraqi chemical and biological warfare agents — if Iraq is capable of using them. The gas masks, detection alarms and protection suits don’t work, according to internal Department of Defense documents uncovered during investigations by the U.S. General Accounting Office. This leaves U.S. troops highly vulnerable to chemical and biological attack. U.S. chemical and biological warfare agent casualties in 2002 could be significantly higher than in 1991. Only a few months ago, the Pentagon sent out a press release stating 140,000 U.S. soldiers were exposed to low-levels chemical agents near Khamisiyah, Iraq during the Gulf War. While these soldiers appeared to return home healthy, many tens of thousands face long-term disabling medical problems that are difficult to treat. 2. Scientific evidence shows that even low-level chemical exposures are dangerous. According to a recent National Academy of Sciences report (Gulf War and Health, September 2000), low-levels of chemical warfare agents cause long-term medical problems. This conclusion is based on research resulting from the sarin attack in Japan in 1995. 3. Research shows long-term adverse side effects from mandatory vaccines given to U.S. soldiers deploying to the war zone. According to the product label insert made by BioPort in Michigan, the sole producer, the experimental anthrax vaccine has caused several deaths. The National Academy of Sciences this year concluded there are some risks to the hotly debated vaccine. 4. The Gulf War battlefield remains radioactive and toxic. Scientific research funded by the military and released two years ago links exposure to depleted uranium (DU) ammunition with cancer in rats. Solid depleted uranium bullets, ranging in size from 25mm to 120mm, are used by U.S. tanks, helicopters and planes to attack enemy tanks and armored personnel carriers. The Gulf War battlefield is already littered with more than 300 tons of radioactive dust and shrapnel from the 1991 Gulf War. Another war will only increase the radioactive and toxic contamination among U.S. soldiers. As of today, U.S. troops are not fully trained about the hazards of depleted uranium contamination, even though Congress enacted a law in 1998 requiring extensive training, especially for medical personnel. 5. Research shows long-term adverse side effects from mandatory pills given to U.S. soldiers deploying to the war zone. According to testimony before Congress (Rand Corporation, 1999), the experimental pyridostigmine bromide (PB) anti-chemical warfare agent pills “can’t be ruled out” as linked to Gulf War illness. During the war, soldiers were told to take one pill every eight hours. After the chemical alarms sounded, some soldiers, out of legitimate fear for their lives, took more than the prescribed amount. To date, the long-term consequences of PB pills remain largely unknown. 6. The Iraqi civilian opposition was abandoned by U.S. troops in the first Gulf War. After U.S. troops had liberated Kuwait and conquered southern Iraq at the end of February 1991, former President George H.W. Bush encouraged the Iraqi opposition, mainly civilians, to rise up against the Iraqi dictatorship in March 1991. However, former President Bush left the rebels twisting in the wind to be ruthlessly killed by the Iraqi army’s Republican Guard flying helicopters allowed by the cease-fire arranged by U.S. military and political leaders. U.S. troops in southern Iraq in March 1991 were ordered not to interfere. How can U.S. troops or Iraqi rebels be confident this won’t happen again? Long oppressed by the Iraqi military, what will the civilian population do if Iraq is liberated? The American public won’t support a long-term occupation and high casualties. 7. Many post-cease-fire military actions of the first Gulf War were deplorable. In March 1991, the Iraqi army was in a full route inside Iraq. Against orders, former General Barry McCaffrey slaughtered thousands of retreating Iraqi soldiers after the cease-fire (documented in the article, “Overwhelming Force,” by Seymour Hersh, The New Yorker, 2000). Many U.S. soldiers returned home with serious objections about the course and consequences of such actions, including the horrific carnage of the “highway of death,” littered with hundreds of destroyed cars, tanks and human remains (see “Prayer at Rumayla” by Gulf War veteran Charles Sheehan-Miles, Xlibris, 2001). Will there be another massacre of Iraqi soldiers? Will Iraqi troops slaughter U.S. soldiers in retaliation, killing U.S. prisoners or retreating U.S. soldiers? And will the press be allowed onto the battlefield to record what really happens? 8. No one has been held accountable for arming Iraq with chemical and biological weapons from 1980 to 1990. A recent news article reported that top aides for former presidents Reagan and Bush armed Iraq with these weapons during Iraq’s war against Iran between 1980 and 1988 (“Officers Say U.S. Aided Iraq in War Despite Use of Gas,” New York Times, Aug. 18, 2002). Some of these former George H.W. Bush aides now work for President George W. Bush. These advisors did nothing to stop the sale of the chemical agents to Iraq, did nothing to stop the use of the agents by Iraq, and did nothing to tell the world about Iraq’s crimes, even when the world learned Iraq used poison gas against civilians. These top political aides have remained silent for more than 14 years, and many refused to comment on the recent news reports. 9. U.S. allies in Europe oppose invading Iraq. They have refused to supply soldiers, funding or logistical support. Some of the serious U.S. battlefield casualties from 1991 were sent to U.S. military hospitals in Germany. Where will our casualties be flown to for emergency care if Germany follows through on its policy to remain neutral and not allow the use of German airspace? This contrasts sharply with the more than 30 nations allied with the U.S. during Desert Storm in 1991. Today, the U.S. has no Arab allies. In 1991, the U.S. forgave billions in outstanding loans owed by Egypt to buy its support. Now Egypt and other Middle Eastern nations oppose a second invasion of Iraq. If something goes wrong, where will U.S. troops retreat if Saudi Arabia won’t allow U.S. troops within its borders? We must avoid another Gallipoli. 10. The Department of Veterans Affairs will not be able to care for additional casualties because VA can’t even take care of current VA patients. Most veterans now wait six months to see a VA doctor, and most veterans wait more than six months to receive a decision on a VA disability claim. Many of those waiting in line are Gulf War veterans, many with unusual illnesses. According to VA, of the nearly 700,000 veterans who served in Desert Shield and Desert Storm, more than 300,000 have sought VA healthcare, and more than 200,000 have filed VA disability claims. Two weeks ago, President Bush slashed $275 million from the healthcare budget of the Department of Veterans Affairs. Although the Iraqi government is a corrupt dictatorship that must eventually be removed, current proposals to remove the government by deploying hundreds of thousands of U.S. troops are deeply flawed. A premature attack against Iraq, especially when the public opposes it, would be a horrible mistake. Since 1990, more than 400 U.S. soldiers have died in the Gulf War theater of operations. Untold hundreds of thousands of Iraqis, both soldiers and civilians, also died. A second invasion of Iraq for one man is not worth one more life; let’s use common sense and avert a second Gulf War. The author is a Gulf War combat veteran.